Tomorrow marks the second performance for Joshua Bell and Edgar Meyer with the LA Philharmonic at the Hollywood Bowl. On Monday, I caught up with Bell at the Bowl. Today, I met Meyer in West Hollywood for a conversation about his new Double Concerto. 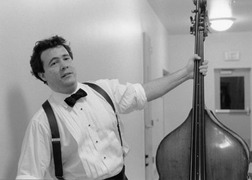 The Nashville-based double-bassist is a leading performer in lots of different genres–classical, bluegrass, folk, jazz, and more. And the music he composes often fuses those many musical influences. 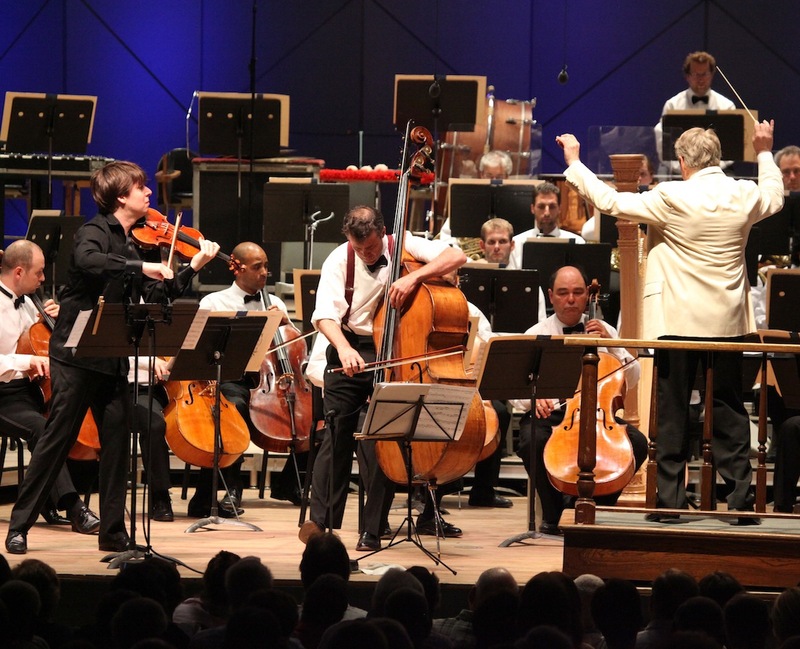 BL: Joshua Bell was telling me about how the two of you first met at Indiana University. You were both teenagers when you started playing together. EM: Yeah, we were in a very musically rich environment. I didn’t grow up in the bosom of classical music per se and so this was really the time that I was concentrating on trying to become a classical string player–I mean, I always technically had been one–but really going a lot deeper in the culture and learning a lot more about the history and how it works and things like that. So, Josh and I met at what were really formative years ultimately for both of us and I can certainly say that he influenced my voice on the instrument and that’s something I would say about very few living players [of stringed instruments]. We have a synchronicity that does date to that time and his ability to comprehend what I’m going after is rare in classical players. BL: What does that mean when you say his voice influenced the way you approach your instrument? EM: There is a lyrical but yet direct and simple way that he will play a melody. It’s anything but expressionless, but it’s also a very well-defined entity. 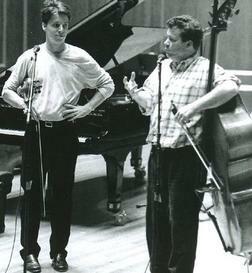 The combination of [Bell’s violin teacher Josef] Gingold and Josh and my friend Gary Hoffman who is a great cellist who was there at the time was a formative influence on the choices I made over the next 20 years in terms of what I wanted my voice to be. BL: So, how did this Double Concerto come about? EM: I’ve always had a thing for string concertos and it really has to do with my father. Every Sunday morning before we would head off to church, the real church would be at home where he would be playing records. He really loved the Bach and Beethoven and Brahms Violin Concertos–Heifetz and Oistrakh–and for me that became church. The double bass doesn’t naturally participate in that–there’s no repertoire remotely comparable–but it became something rather central to me. Josh and I, with the musical connection that we have, and with my attraction to that format, I’d had it in the back of my mind for 20 years to do this and I finally talked to Josh about it a few years ago and we figured out how to make it happen. BL: So, violin and double bass: the outer limits of the string world. I was looking for pieces that have been written for violin and double bass. There’s the Bottesini Gran Duo Concertante and there’s a Stamitz thing, but it’s a rare combination. How do you make it work? EM: I don’t go back to precedent at all, although the Bottesini, for what it’s worth, is effective. It’s very much a novelty, but Bottesini’s two primary virtues were that he clearly played the instrument well, so everything feels right on the instrument immediately and he had a lyric gift, I mean, he was not the worst composer that ever lived. I actually relied more on Josh’s and my own precedent in terms of different things we’ve done. And also, honestly, I work with a lot of great violin and mandolin players outside of classical music and that is an influence on the way that I have the two instruments interact–in fact, it’s a huge influence. Most fundamentally, in this Double Concerto I elected to have Josh carry the majority of the melody as I would do if we played a duet. I probably could or should have pushed the bass a little further forward, but I don’t have any regrets about it because the natural interaction is for me to play bass lines and for him to play melodies. So, in a nutshell that’s how I deal with it. Not try to put them on equal footing, but actually trying to see what’s natural for the instruments. BL: So, this piece is mere weeks old. EM: That’s correct. It couldn’t be newer. And ironically for me, that’s an early delivery. I’m very grateful that it was done in time to get to play it! BL: You’ve been living in so many different musical worlds during your career. And now there’s this new generation of musicians who like to claim they live in a post-genre reality. Do you feel like you’ve been a leader or an inspiration for that movement? EM: It’s hard to say, because I don’t know enough of them to make that call. I think I encourage it. I’ve not wanted to promote doing anything half-assed. It’s tricky when you’re playing in multiple styles and you don’t want to be [someone] when you’re not getting something quite right who says, “But that’s pretty good for an improviser.” Or, “Well, that’s kind of stiff, but you know, that’s better than most classical players would play that.” That’s the kind of thing I would always be scared of and the unfortunate result of that is it makes me a little bit of a curmudgeon and a little ornery about the subject. … I like to see diversity. I like to see some people who don’t want to do anything but classical music and I like seeing people who like to push. I think music in general is richer if you have that kind of diversity. If people are talking about it, if people are disagreeing about it, all the better. You need those different forces pushing on each other a little bit. BL: A signature component of your concert attire is suspenders. Have you ever thought of pursuing an endorsement deal for suspenders. EM: No. We’ll have to see if I keep wearing the suspenders. There’s one drawback to them, which is on certain quiet passages where I have to reach way up the bass, sometimes they rub and the leather part makes a noise. And that’s actually a little uncomfortable. The truth of the matter is that I would rather play in a jacket, but it’s not possible. Because especially on the left hand, I have to have a rolled shirt sleeve. Anything here [on my forearm] will catch as I come over [the shoulders of the bass]. I’ve tried things and at some point in my 20s I realized that I would rather give myself the best opportunity to play well, so I have to have a rolled shirt sleeve. You know, I’ve actually been playing a lot of concerts recently without suspenders. But the main thing is no jacket. BL: Tell me something about Nashville that would surprise an Angeleno. EM: Nashville came out ahead of Los Angeles on the sprawl index. I love this sort of fusion music of no exact genre.